1933 Half Sovereign (10/-) Riddle/Sheehan KGV banknote with thick Sheehan signature G. A well circulated note with some staining and a few small tears, but rare. 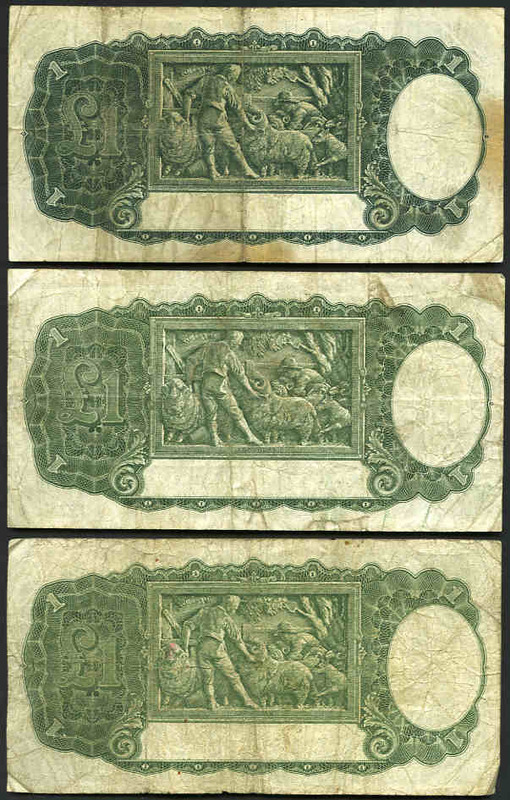 McDonald 15. 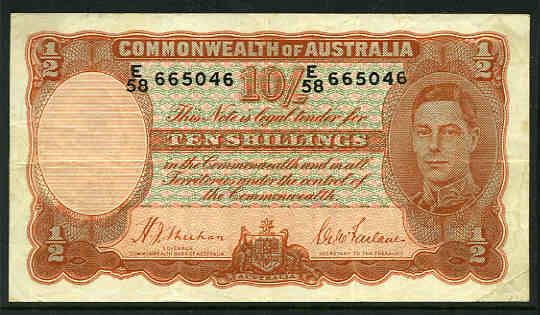 1939 10/- Sheehan/McFarlane KGVI banknote VG. 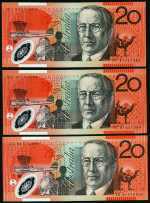 McDonald 20. 1933 £1 Riddle/Sheehan KGV Banknote. 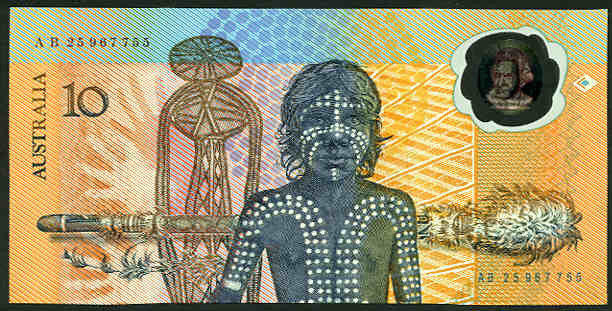 Crisp Unc note that has been cleaned and pressed. 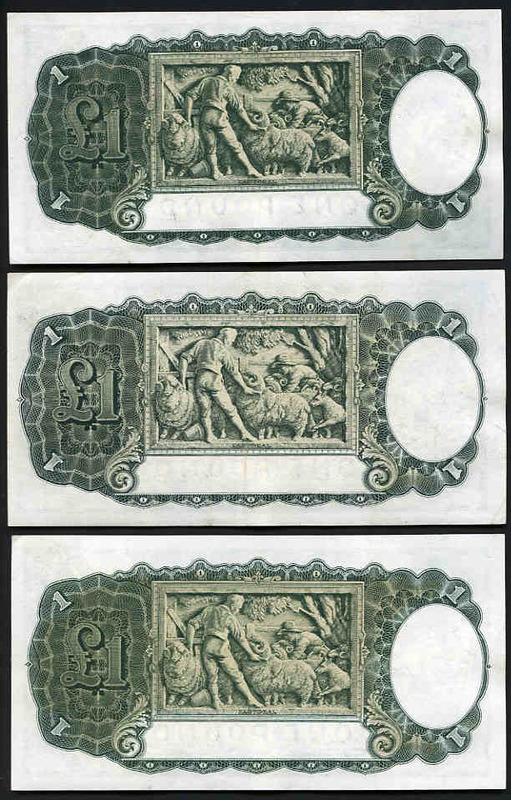 1933 £1 Riddle/Sheehan KGV Banknotes (10). 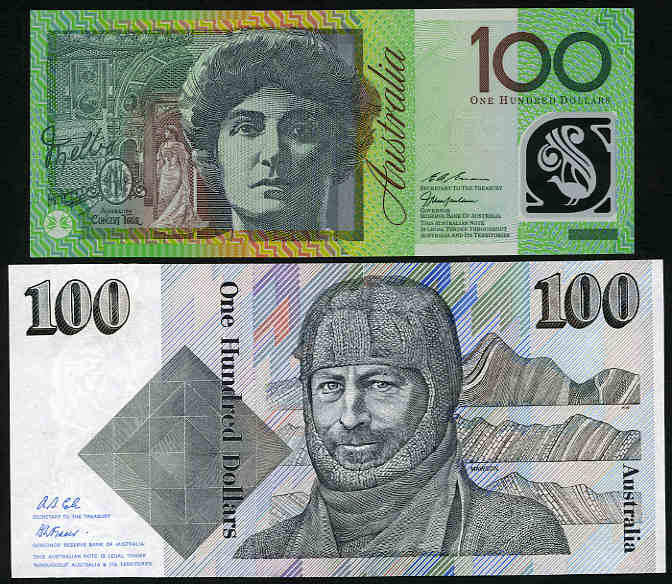 All have been cleaned, 3 with small tears, otherwise graded F/VF. 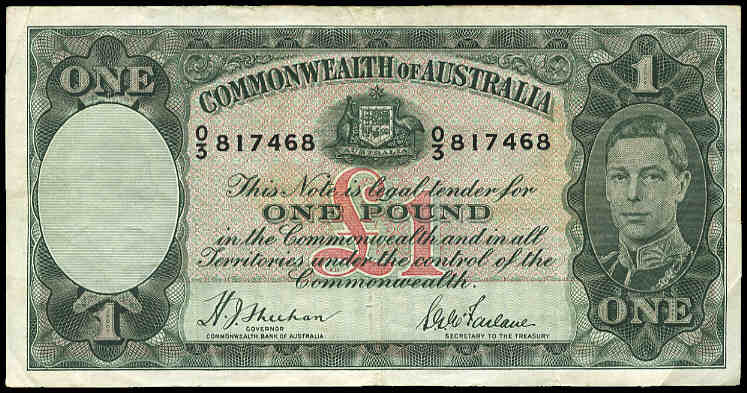 1938 £1 Sheehan/McFarlane KGVI banknote F. McDonald 45. 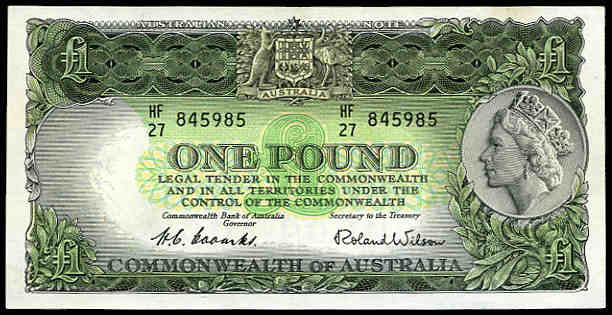 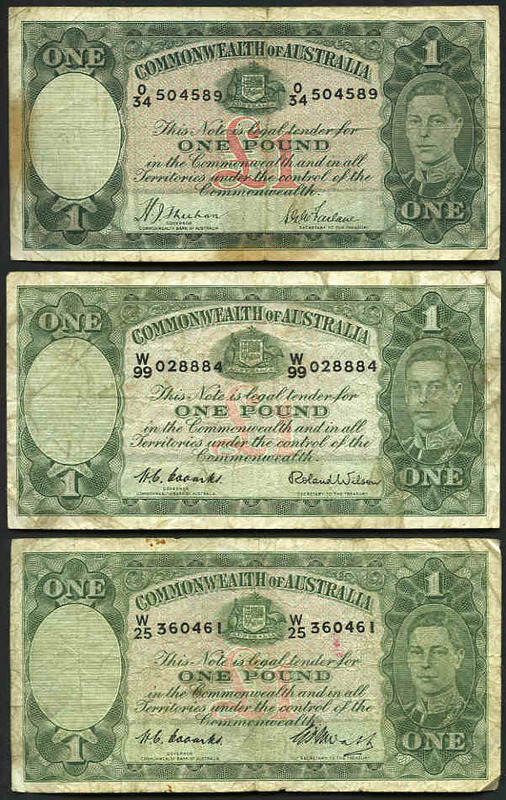 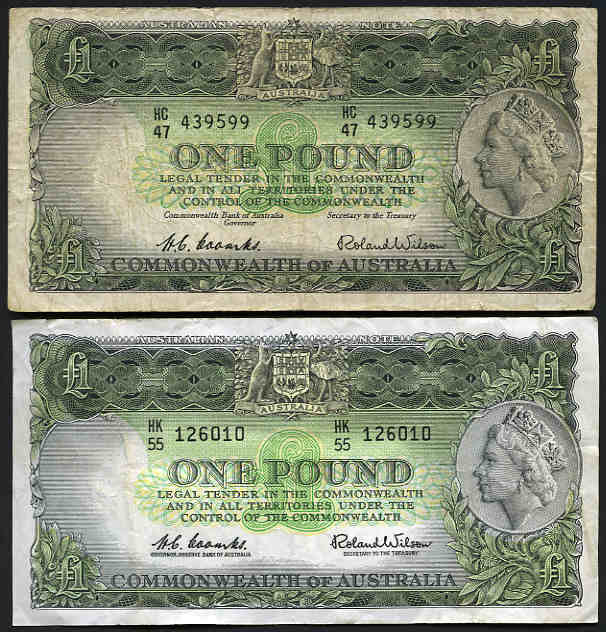 1942 10/- Armitage/McFarlane, 1938 £1 Sheehan/McFarlane, 1949 £1 Coombs/Watt, and 1952 £1 Coombs/Wilson KGVI banknotes and 1953 £1 Coombs/Wilson Commonwealth Bank and 1961 £1 Coombs/Wilson Reserve Bank QEII banknotes, all grading G-VG. 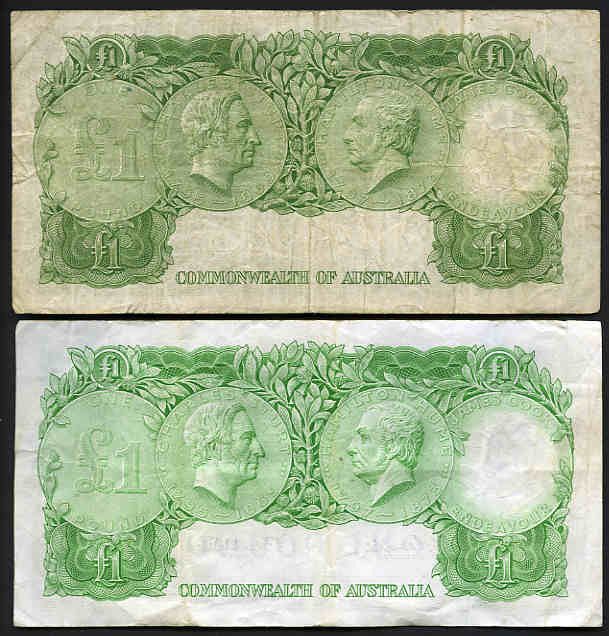 1949 £1 Coombs/Watt banknote F. Some folds, but a cleaner crisper banknote than usually found in this grade. 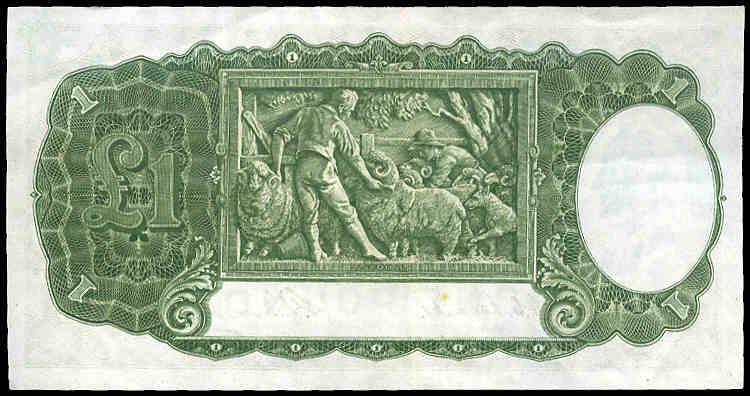 McDonald 48. 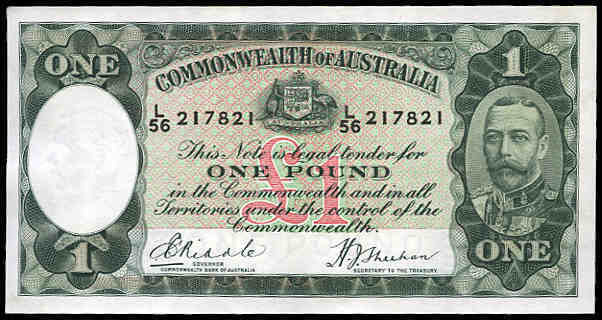 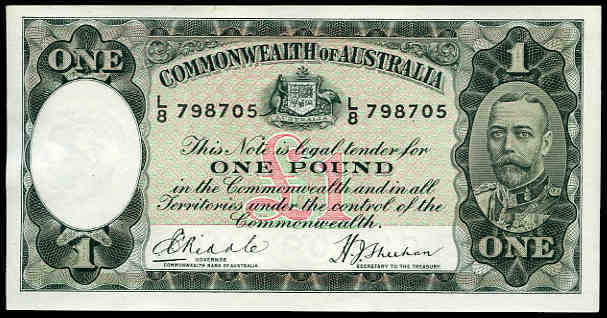 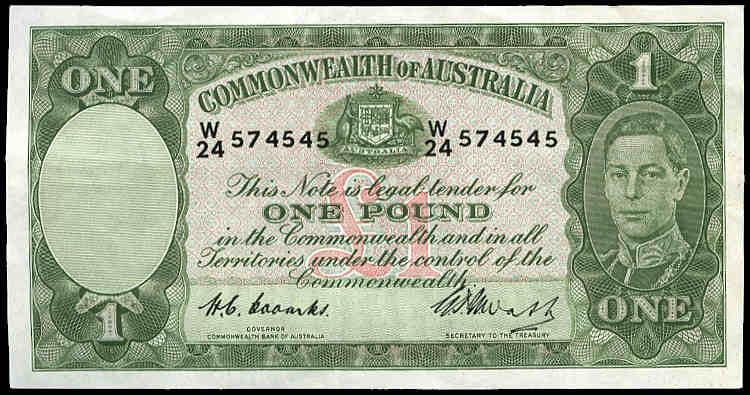 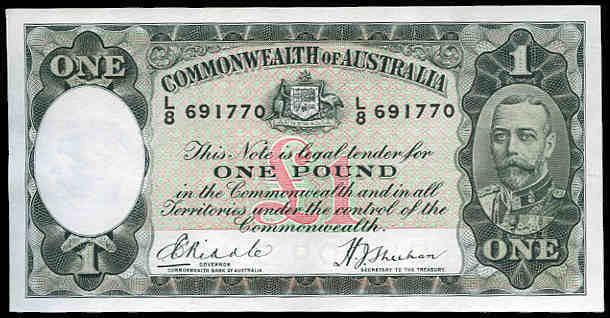 1953 £1 QEII Commonwealth Bank banknote Unc. 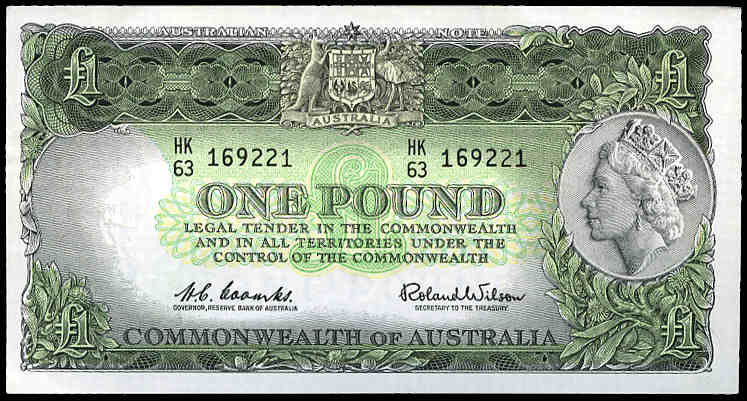 1961 £1 QEII Reserve Bank Emerald Green reverse banknote EF almost aUnc. 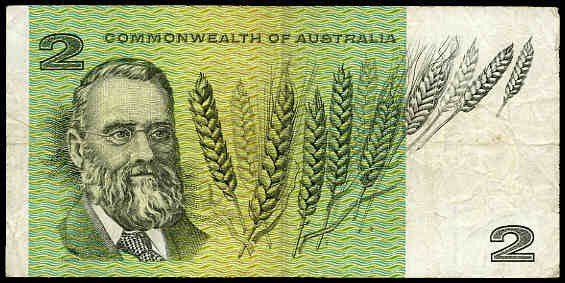 1960 £5 Coombs/Wilson Reserve Bank banknote EF. 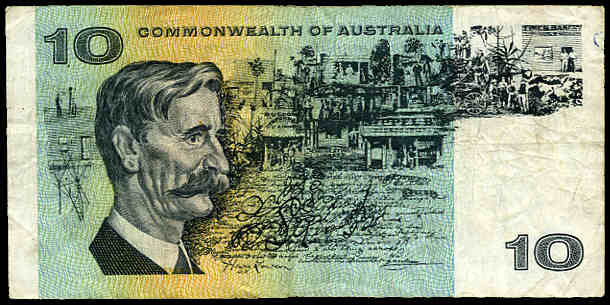 1966 $1.00 Coombs/Wilson banknote Unc. 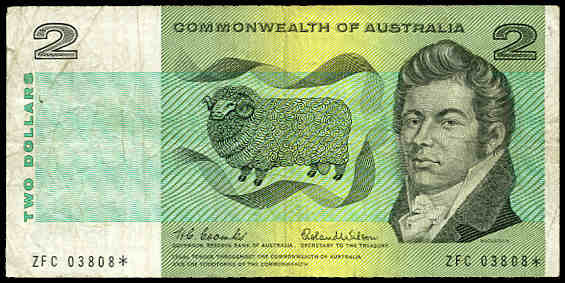 1966 $1.00 Coombs/Wilson, 1969 $1.00 Phillips/Randall (2), 1972 and 1974 $1.00 Phillips/Wheeler, 1976 $1.00 Knight/Wheeler centre thread (4) and side thread (4), 1979 $1.00 Knight/Stone (9), 1982 $1.00 Johnston/Stone (5) and 1968 $2.00 Phillips/Randall, 1974 $2.00 Phillips/Wheeler, 1979 $2.00 Knight/Stone and 1983 $2.00 Johnston/Stone (6) banknotes aUnc. 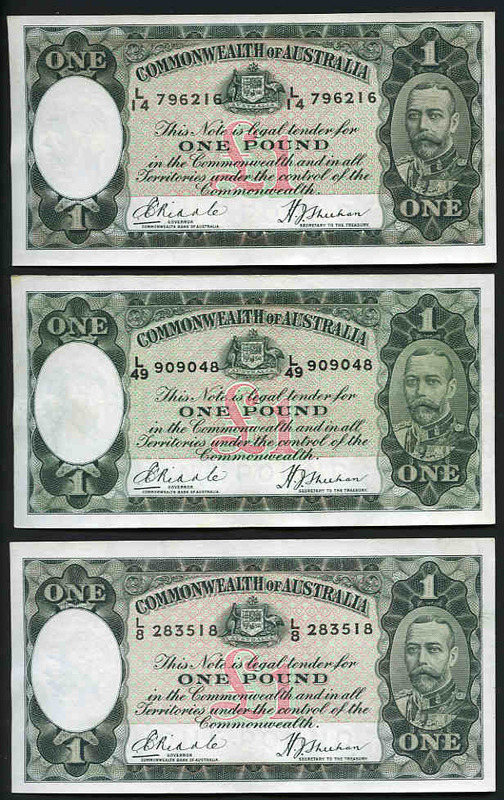 Some consecutive. 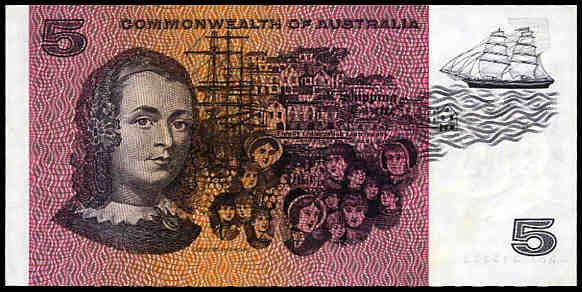 McDonald Catalogue Value $710.00. 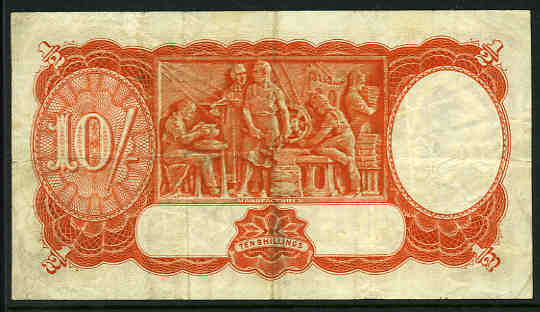 1968 $1.00 Coombs/Randall, 1969 $1.00 Phillips/Randall (4), 1972 $1.00 Phillips/Wheeler, 1976 $1.00 Knight/Wheeler centre thread (1) and side thread (6), 1979 $1.00 Knight/Stone (2), 1982 $1.00 Johnston/Stone (3), 1972 and 1974 $2.00 Phillips/Wheeler, 1979 $2.00 Knight/Wheeler side thread (6), 1985 $2.00 Johnston/Fraser (7), 1985 $5.00 Johnston/Fraser side thread with Gothic serial numbers (2) and 1985 $10.00 Johnston/Fraser (2) banknotes EF. 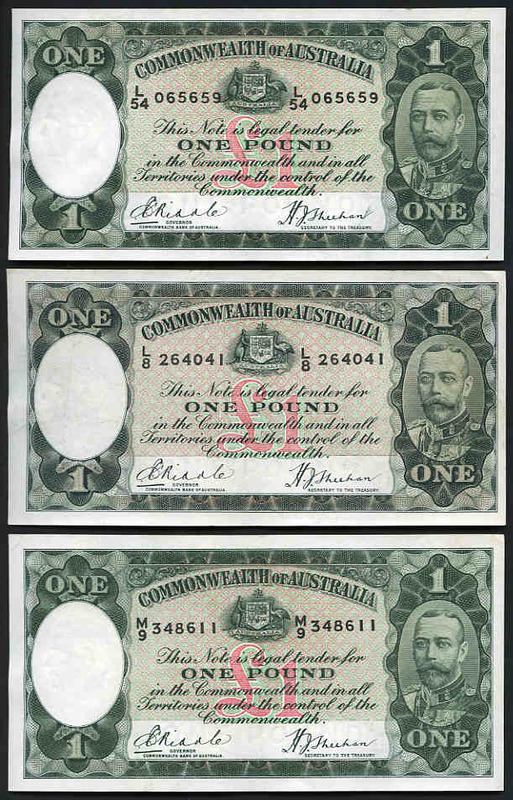 Some consecutive and few aUnc. 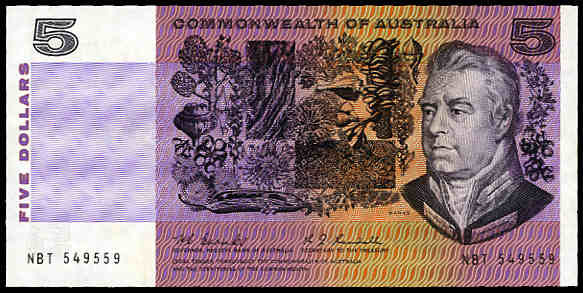 McDonald Catalogue Value $966.00+. 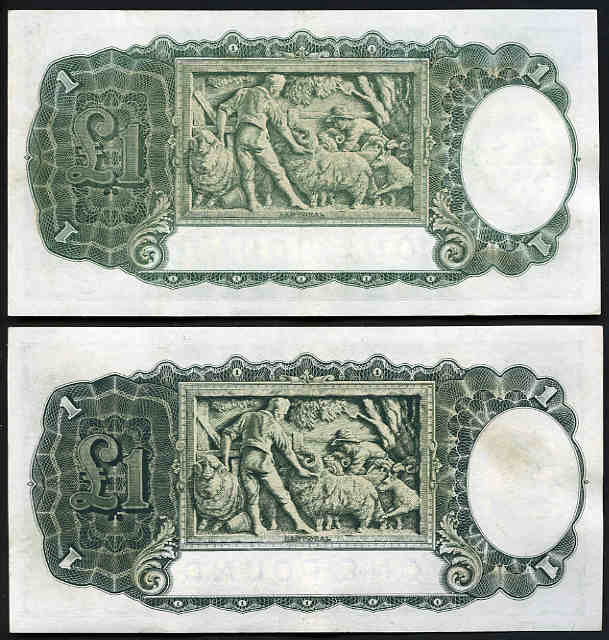 1969 $1.00 Phillips/Randall, 1979 $2.00 Knight/Stone (3, 2 consecutive), 1985 $5.00 Johnston/Fraser Gothic serial numbers, 1966 $10.00 Coombs/Wilson, 1979 $10.00 Knight/Stone OCR-B serial numbers and 1966 $20.00 Coombs/Wilson and 1991 $20.00 Fraser/Cole banknotes aUnc. 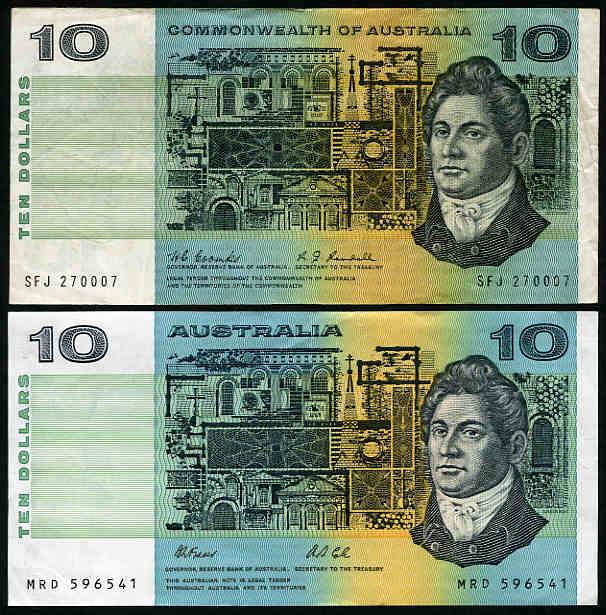 1969 $1.00 Phillips/Randall, 1966 $2.00 Coombs/Wilson, 1968 $2.00 Phillips/Randall, 1972 $10.00 Phillips/Wheeler EF and 1966 $20.00 Coombs/Wilson banknotes EF. 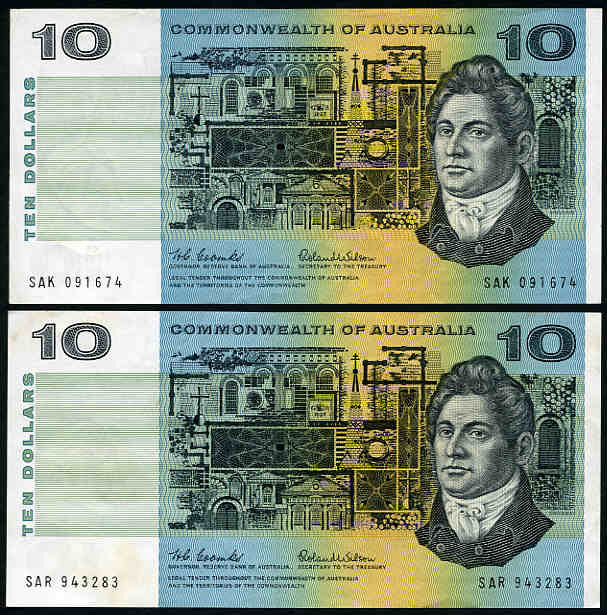 1982 $1.00 Johnston/Stone bundle of 100 consecutive banknotes Unc. 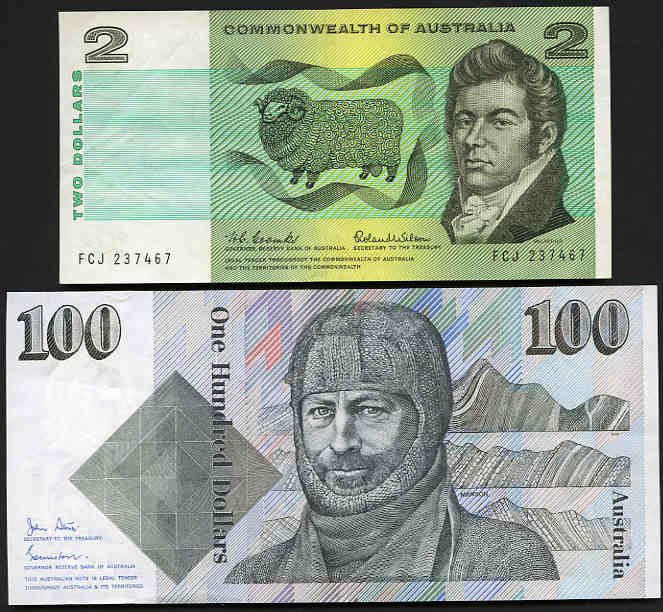 1982 $1.00 Johnston/Stone (124) and 1985 $2.00 Johnston/Fraser (34) banknotes Unc. 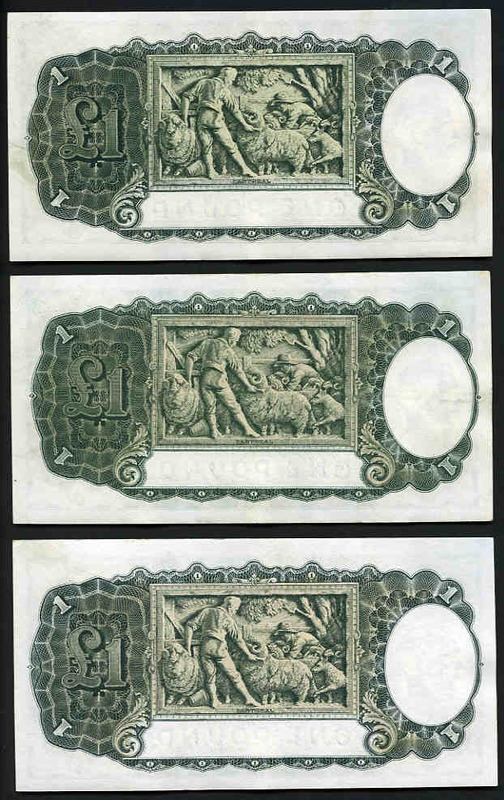 Some consecutive. 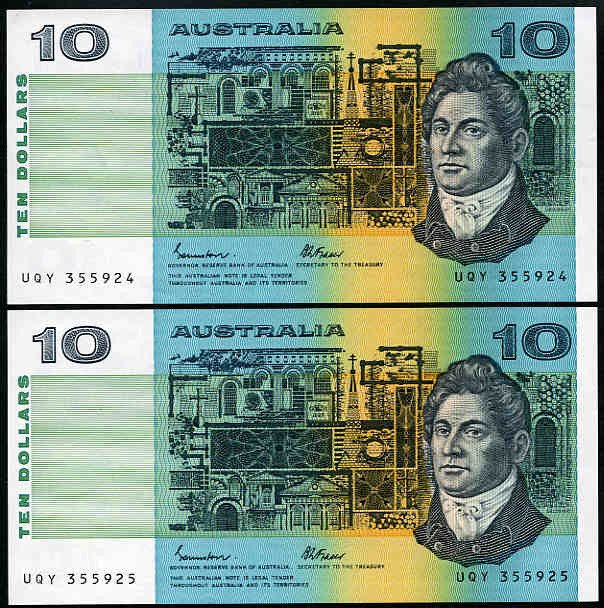 1982 $1.00 Johnston/Stone Unc (8), 1985 $5.00 Johnston/Fraser OCR-B serial number aUnc, 1985 $10.00 Johnston/Fraser aUnc and 1988 $10.00 Johnston/Fraser First release Polymer Unc (3) banknotes. 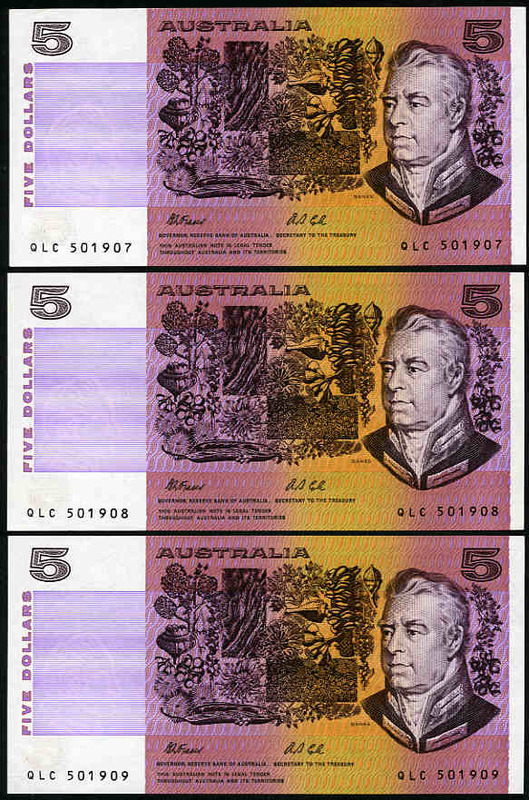 1982 $1.00 Johnston/Stone (2), 1985 $2.00 Johnston/Fraser (4 consecutive), 1985 $5.00 Johnston/Fraser OCR-B serial number (4 consecutive), 1992 $5.00 Fraser/Cole Dark Green prefix, 1995 $5.00 Fraser/Evans, 2001 $5.00 Macfarlane/Evans, 1985 $10.00 Johnston/Fraser, 1993 $10.00 Fraser/Evans Blue Dobell shading (2) and 1994 $20.00 Fraser/Evans banknotes Unc. 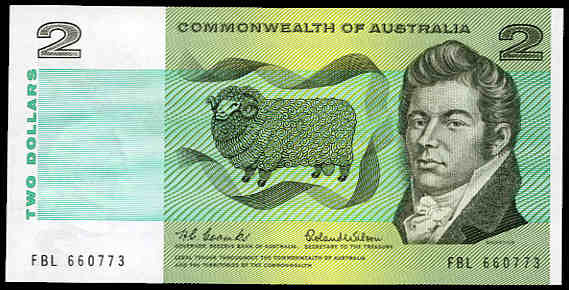 1966 $2.00 Coombs/Wilson banknote Unc. 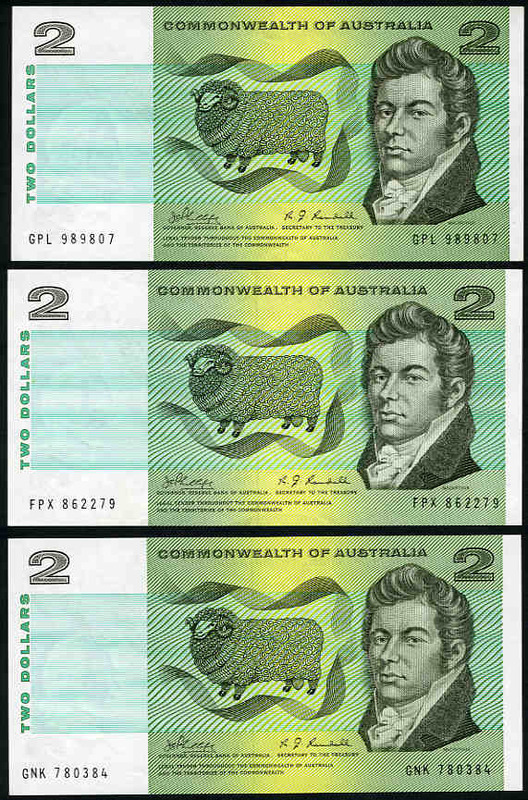 1966 $2.00 Coombs/Wilson Commonwealth of Australia Star replacement banknote good VF. 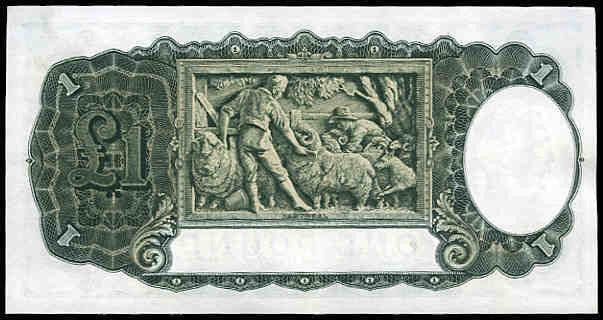 Serial no ZFB 29760*. 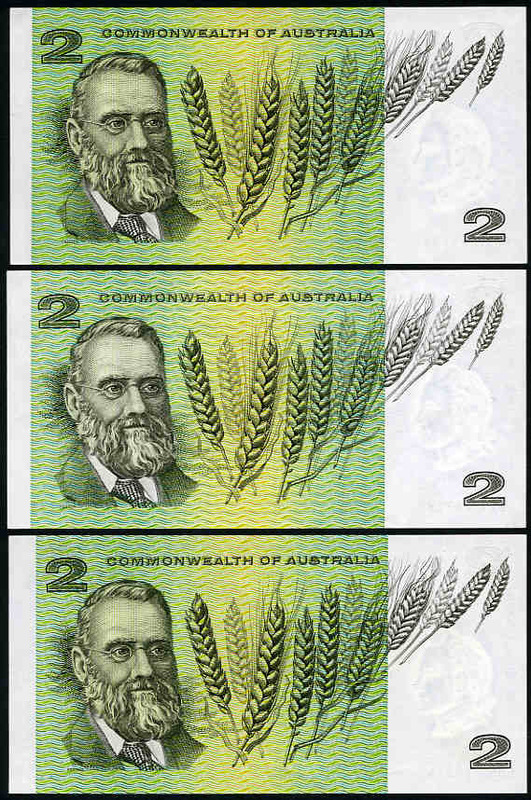 1966 $2.00 Coombs/Wilson Commonwealth of Australia Star replacement banknote VG. 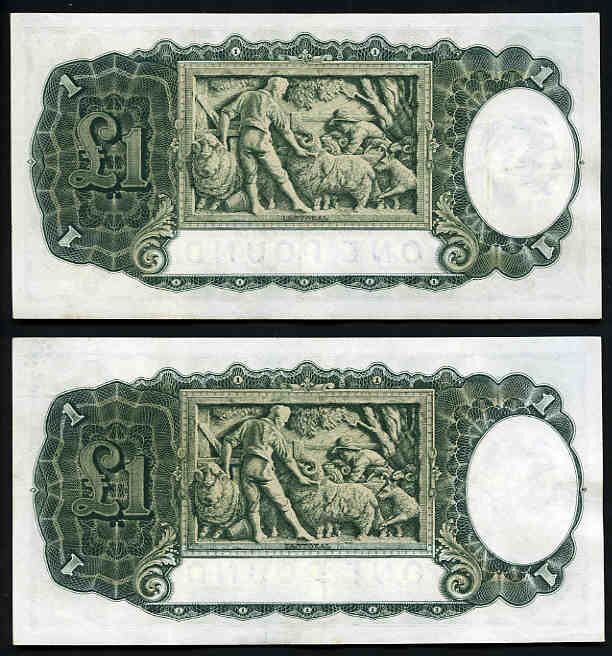 Serial no ZFC 03808*. 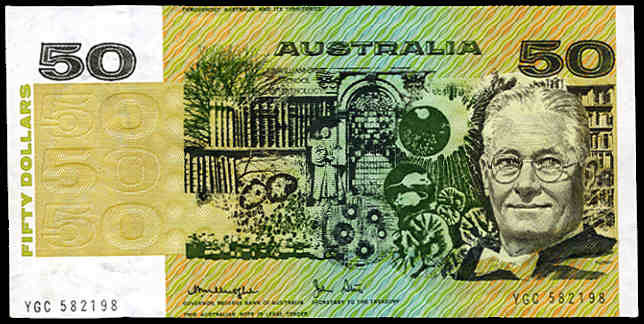 1966 $2.00 Coombs/Wilson banknote EF, 1966 $10.00 Coombs/Wilson aUnc, 1966 $10.00 Coombs/Wilson EF with light tone and 1984 $100.00 Johston/Stone EF. 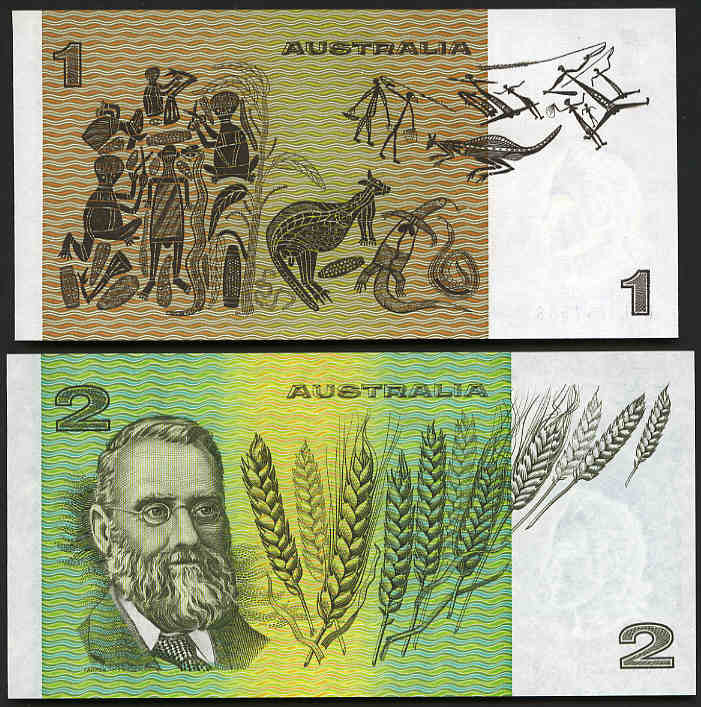 1966 $2.00 Coombs/Wilson banknotes grading from VG to EF (59) and 1968 $2.00 Phillips/Randall VG (3). 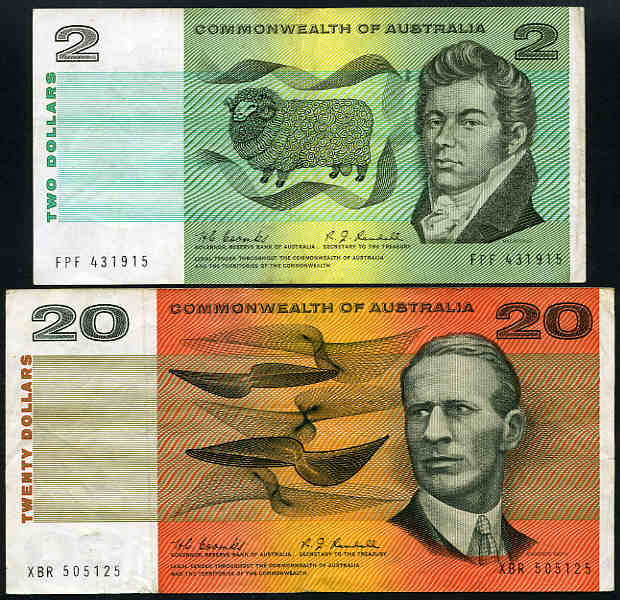 1968 $2.00 Coombs/Randall and 1967 $20.00 Coombs/Randall banknotes F.
1968 $2.00 Phillips/Randall banknote aUnc. 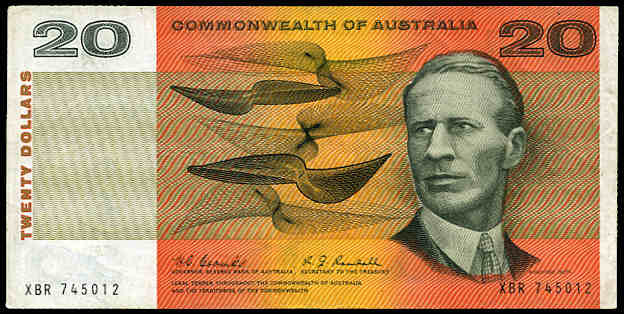 (3). 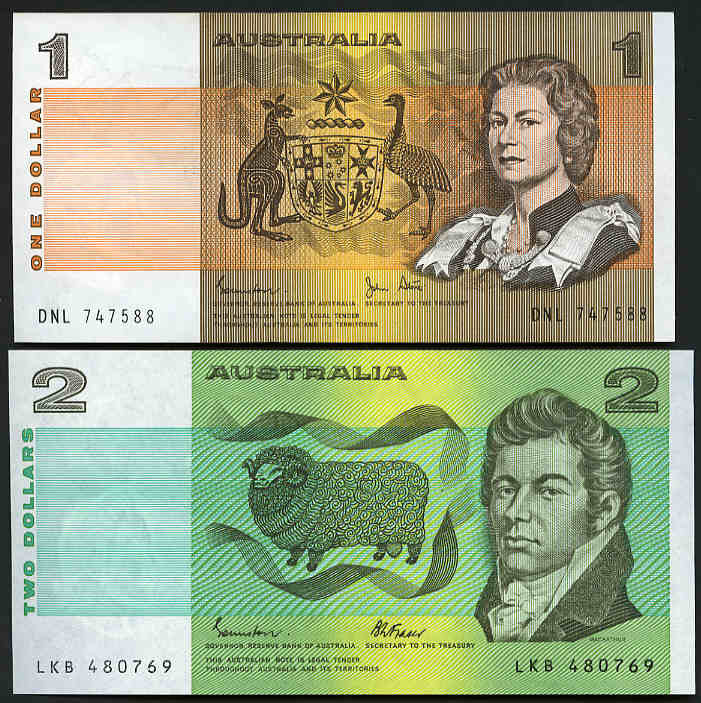 1968 $2.00 Phillips/Randall, 1967 $10.00 Coombs/Randall, 1991 $10.00 Fraser/Cole and 1967 $20.00 Coombs/Randall banknotes F.
1988 $2.00 Last Paper note in general issue folder, 1988 $10.00 Bicentenary Polymer dated note in general issue folder (4, one with last prefix AA23), 1993 $10.00 First and Last Polymer and Paper notes in standard souvenir folder and 2001 $5.00 Centenary of Federation general issue folder (2) with consecutive serial numbers. 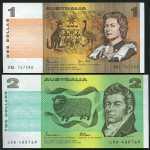 1988 Bicentennial Coin and Note "Melbourne Coin Fair" collection containing $2.00, $5.00 and $10.00 coins, $2.00 and $5.00 Paper notes and $10.00 Polymer note in presentation folder. 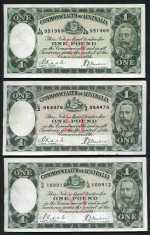 Serial number QAH 006707. 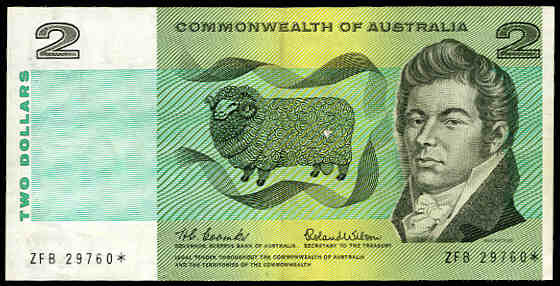 1967 $5.00 Coombs/Randall banknote Unc. 1967 $5.00 Coombs/Randall banknote aUnc. 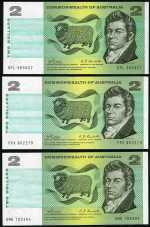 1974 $5.00 Phillips/Wheeler, 1991 $10.00 Fraser/Cole (9, 7 consecutive) and 1991 $20.00 Fraser/Cole banknotes aUnc. 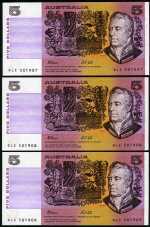 1983 $5.00 Johnston/Stone EF, 1985 $5.00 Johnston/Fraser OCR-B serial numbers aUnc (4 consecutive), 1990 $5.00 Fraser/Higgins EF (2), 1995 $5.00 Fraser/Evans Unc, 1997 $5.00 Macfarlane/Evans Unc, 1979 $10.00 Knight/Stone OCR-B serial numbers EF, 1985 $10.00 Johnston/Fraser EF (3) and 1985 $20.00 Johnston/Fraser OCR-B serial numbers EF banknotes. 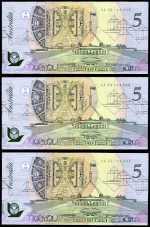 1992 $5.00 Fraser/Cole First prefix AA00 pale green serial number consecutive run of 5 banknotes Unc. 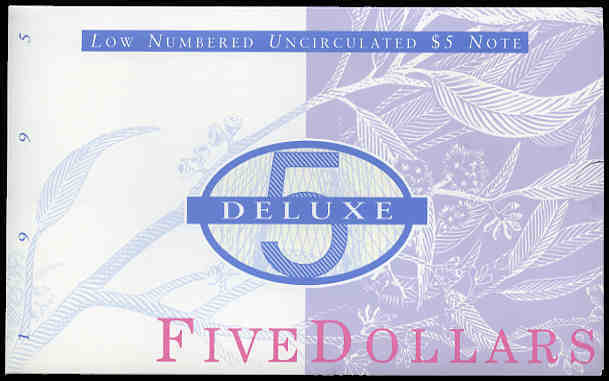 1991 $5.00 Fraser/Cole banknotes Unc. 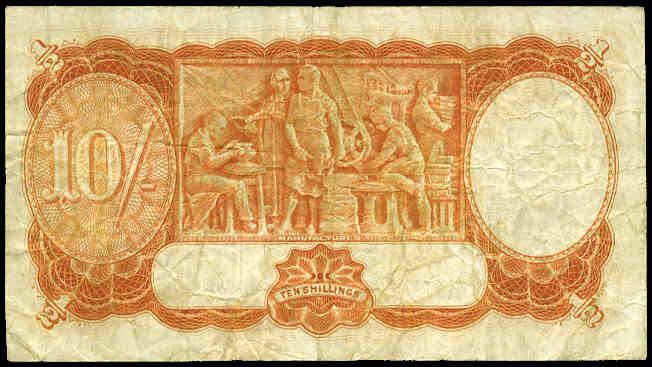 (14). 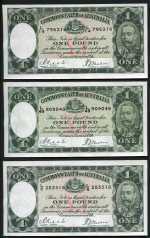 Some consecutive. 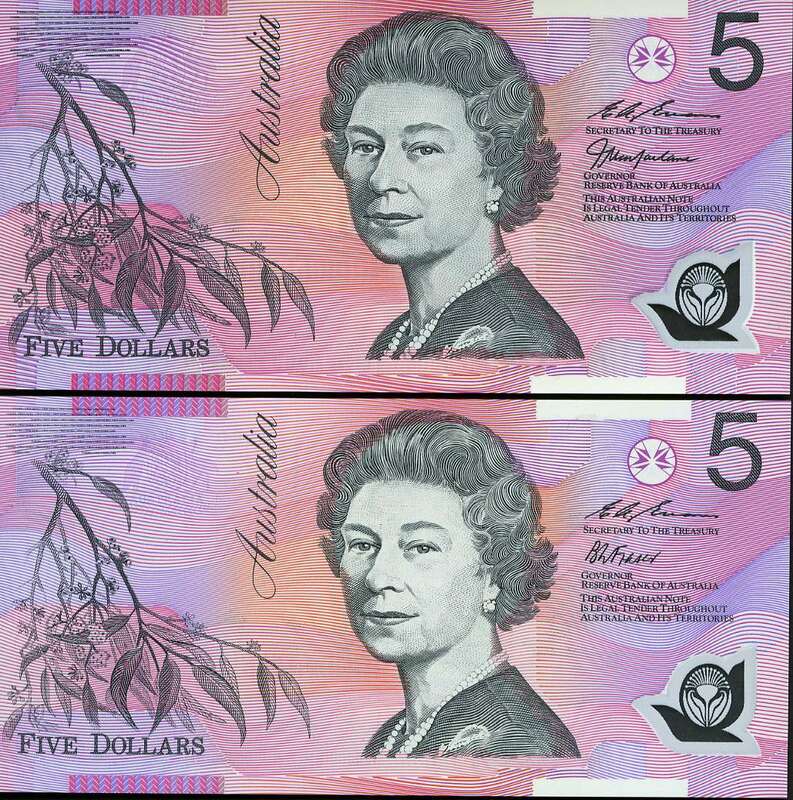 1992 $5.00 Fraser/Cole medium to dark green serial number banknotes Unc. 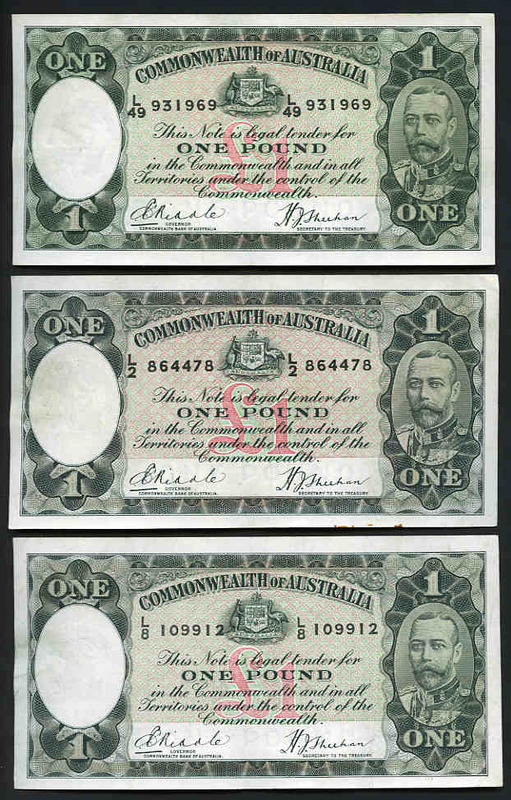 (12, 4 consecutive). 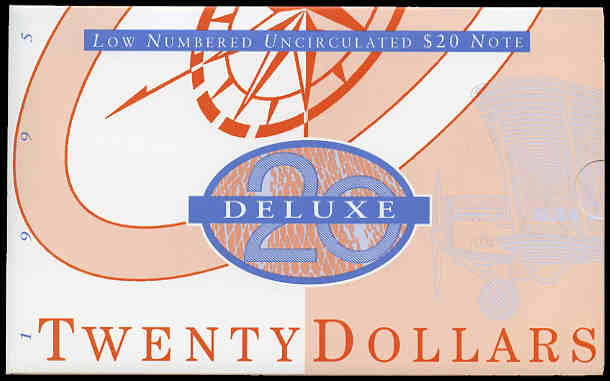 1995 $5.00, $10.00 and $20.00 Deluxe dated polymer note folders with matching serial numbers. 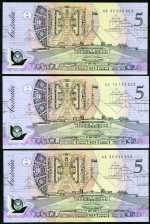 Serial No AA 95006863. 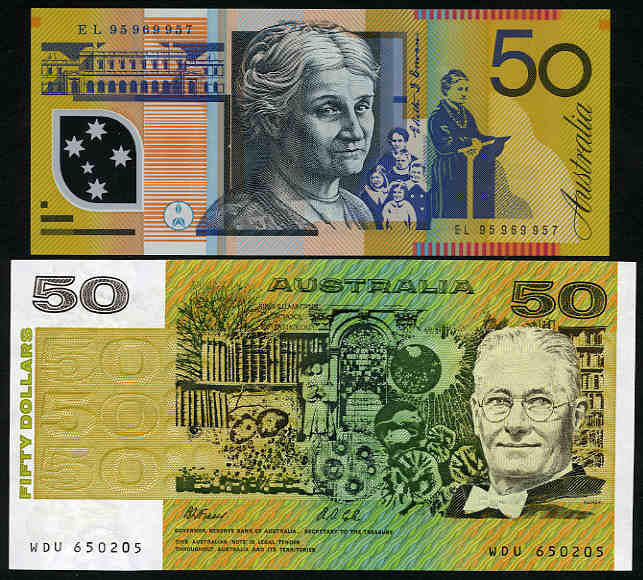 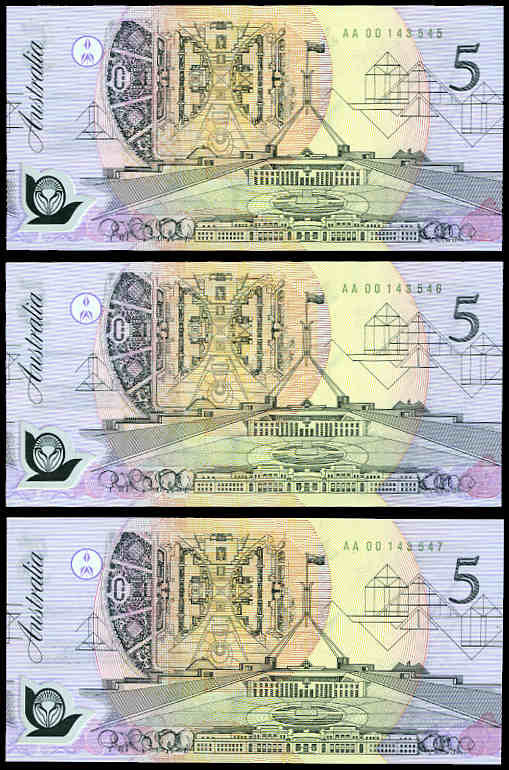 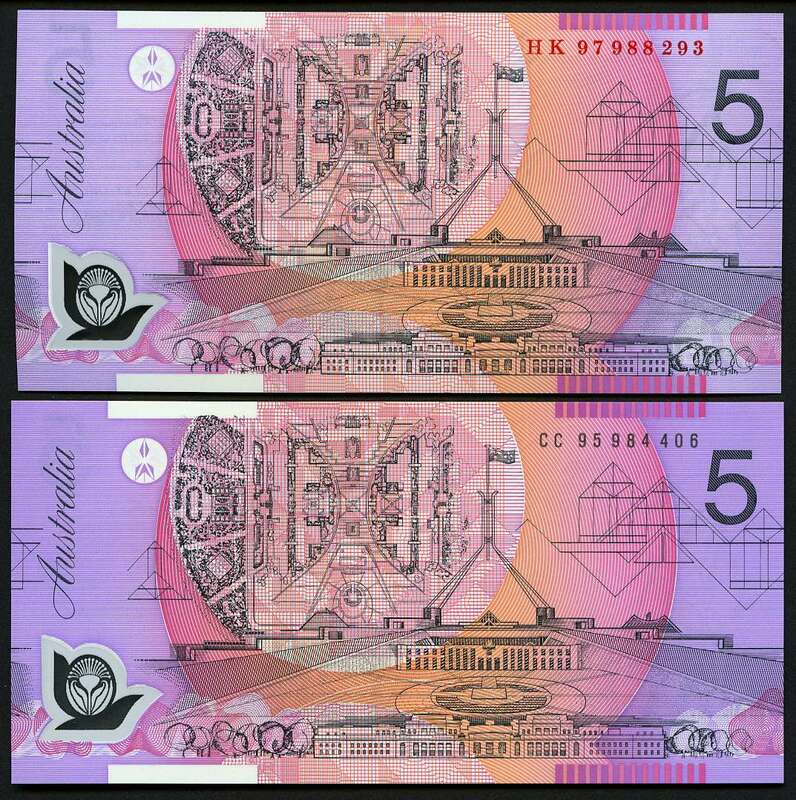 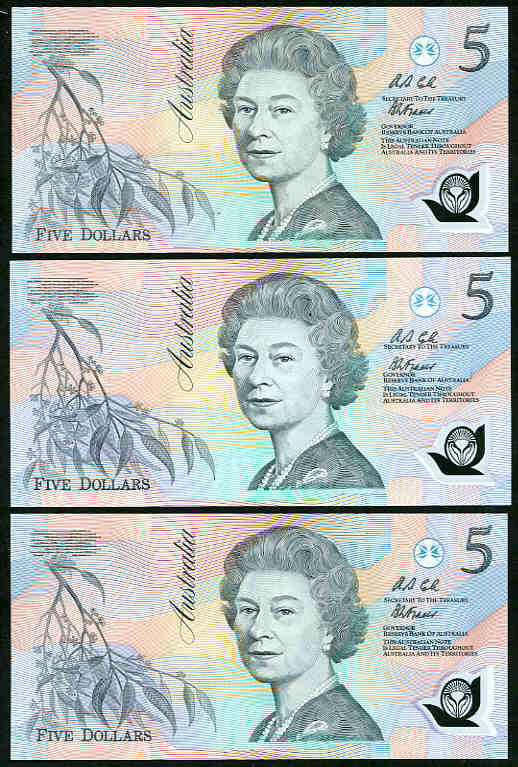 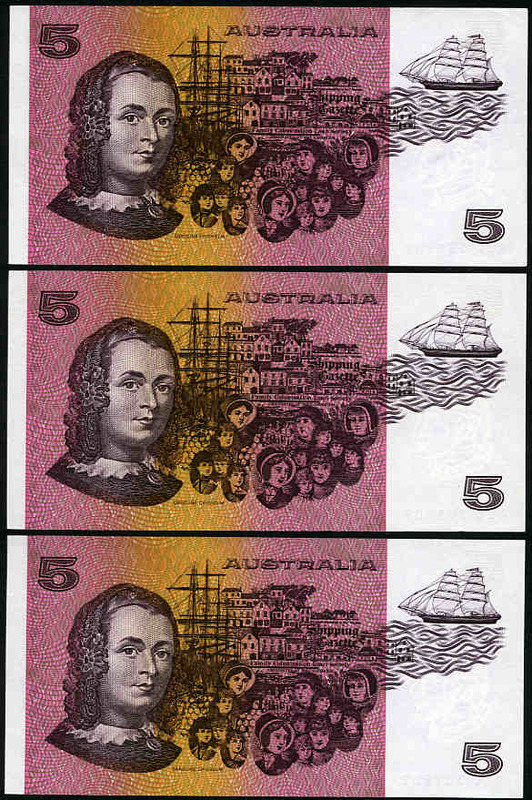 1995 $5.00 Fraser/Evans, 1997 $5.00 Macfarlane/Evans (5, one with "HK97" Red serial numbers), 2001 $5.00 Macfarlane/Evans Centenary of Federation (10) and 2002 $5.00 Macfarlane/Henry First prefix banknotes Unc. 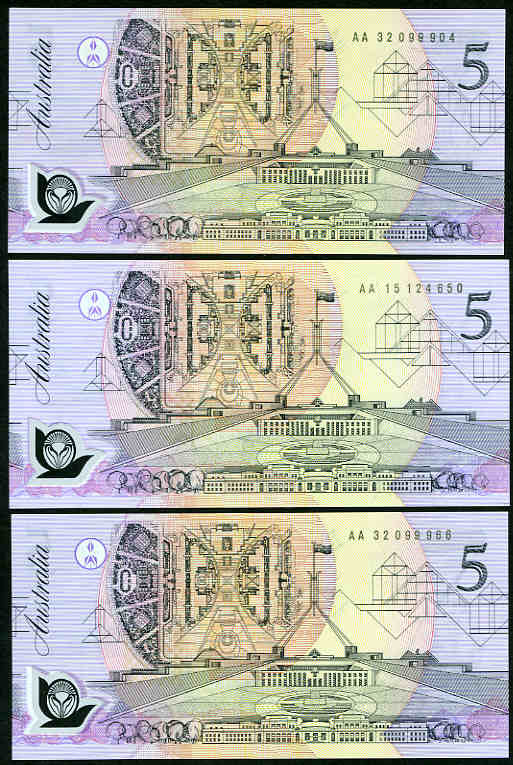 1996 $5.00 polymer note uncut block of 4 with black serial number, uncut vertical pair with red serial number and uncut vertical pair with black serial number in folders. 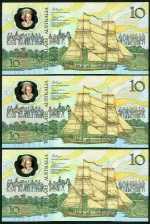 (3 folders). 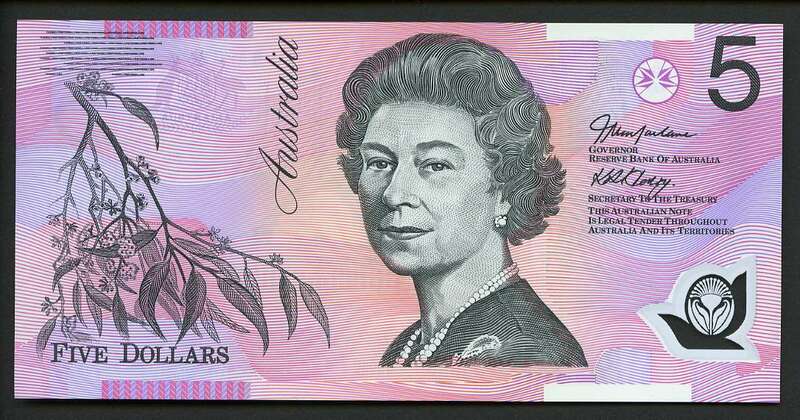 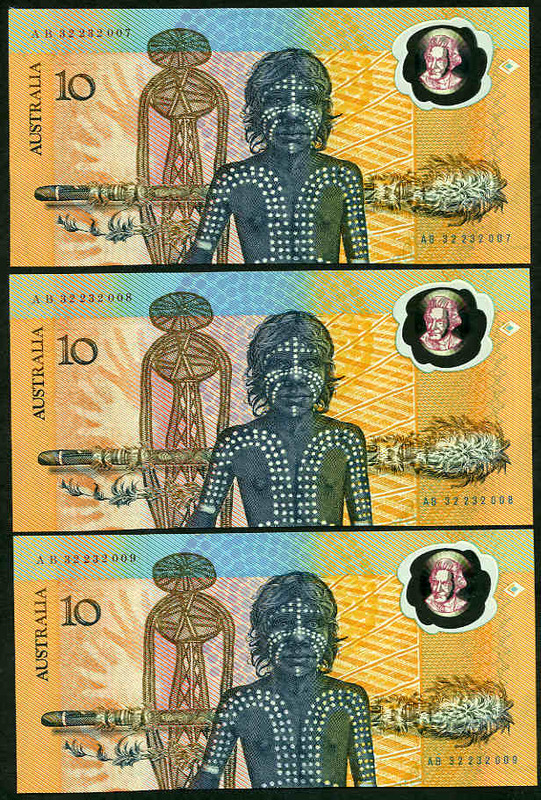 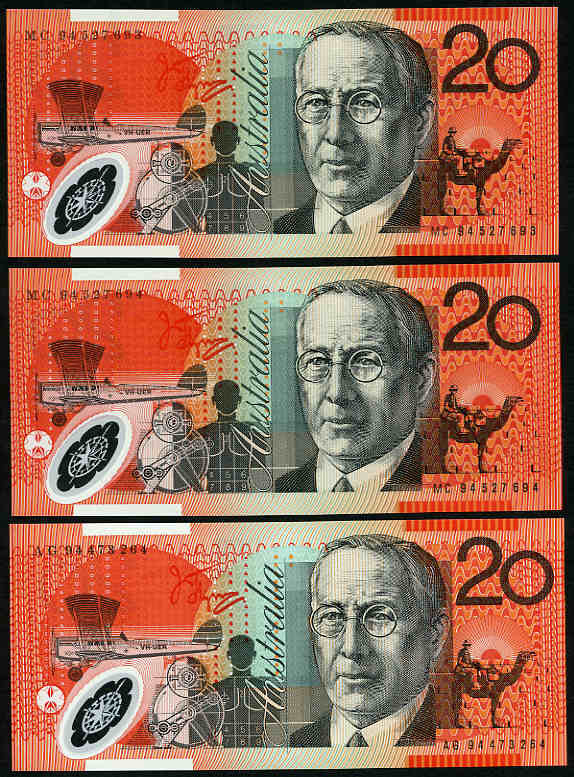 1999 $5.00, $10.00, $20.00, $50.00 and $100.00 premium dated polymer note annual folder. 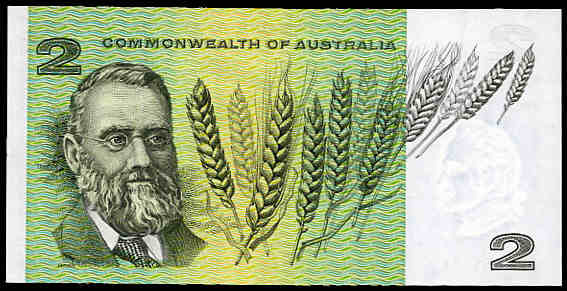 Serial No AA 99000840. 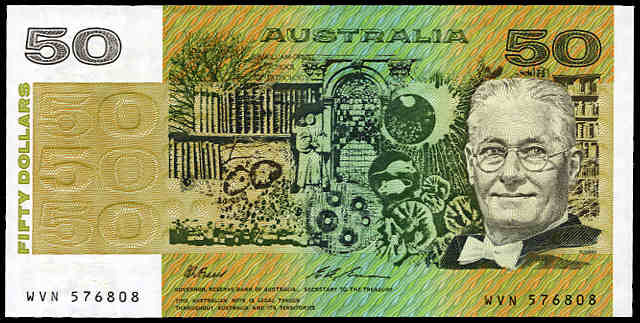 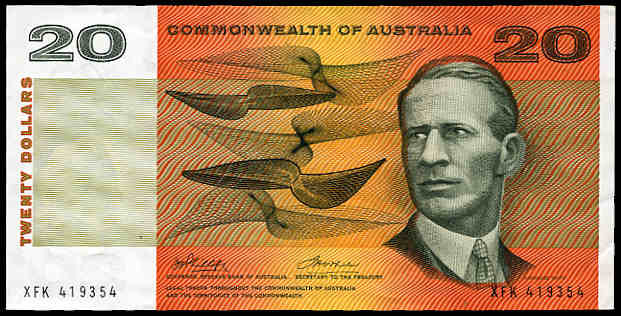 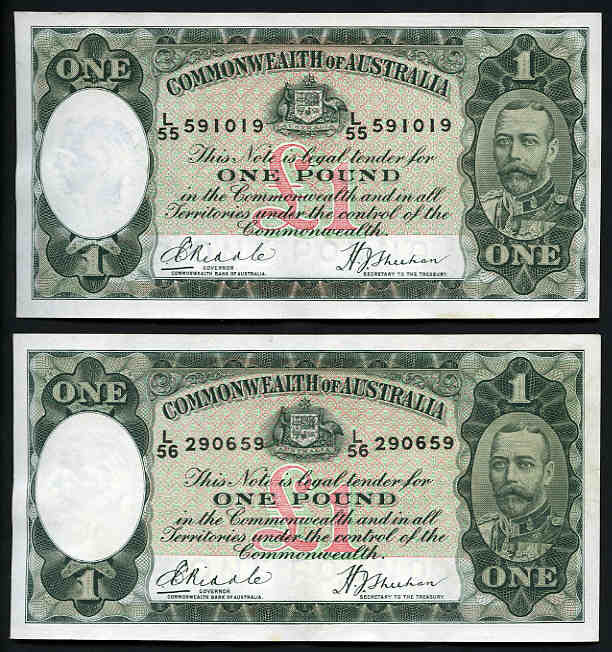 1967 $10.00 Coombs/Randall Commonwealth of Australia banknote EF. 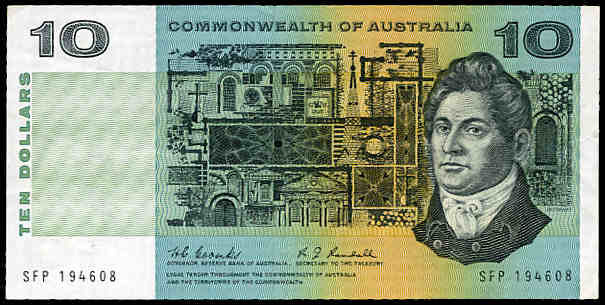 1967 $10.00 Coombs/Randall Commonwealth of Australia banknote VF. 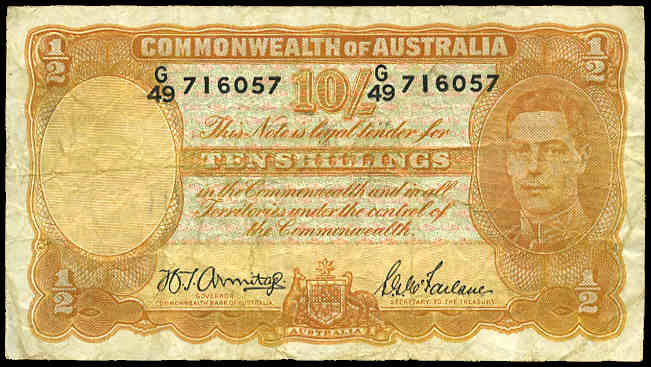 1967 $10.00 Coombs/Randall Commonwealth of Australia banknote VG. 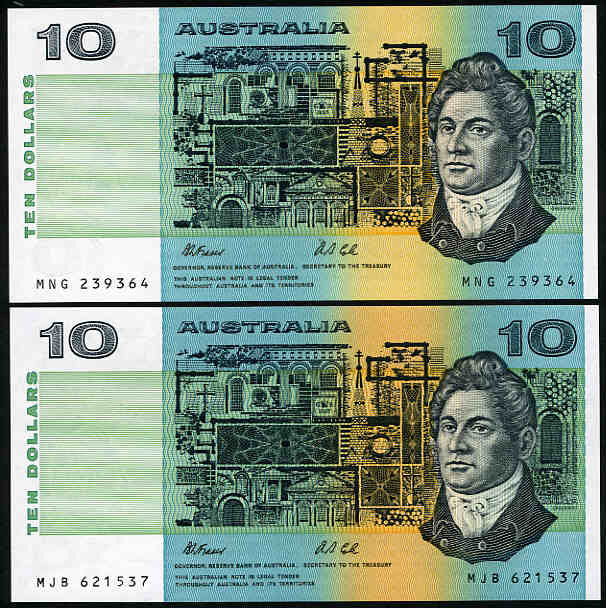 1985 $10.00 Johnston/Fraser (6) and 1991 $10.00 Fraser/Cole (4) banknotes Unc. 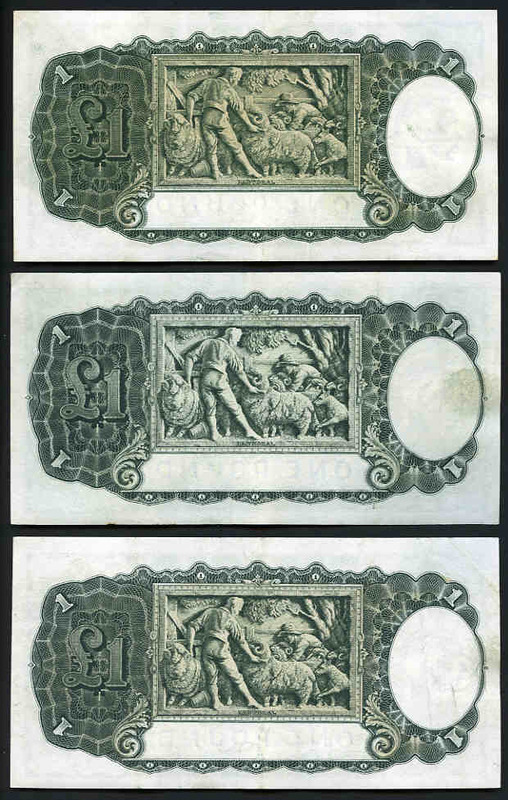 Some consecutive. 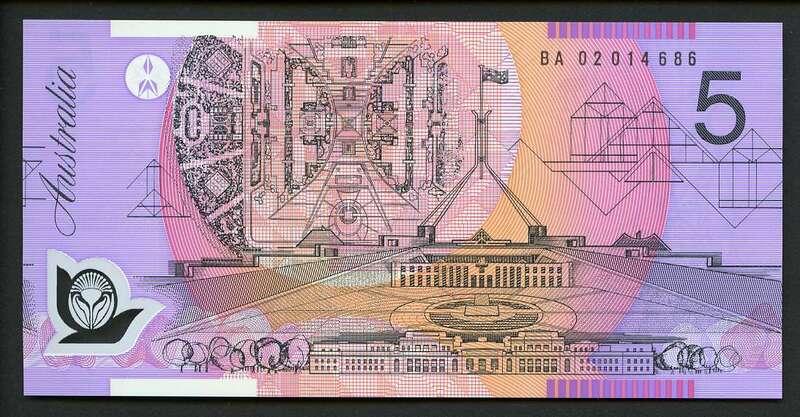 1988 $10.00 Second release Bicentenary Polymer banknote with first prefix AB10 VF. 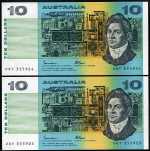 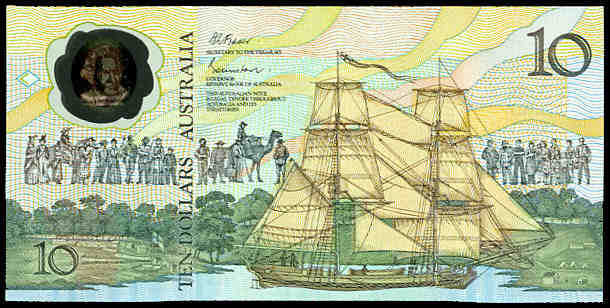 1988 $10.00 Bicentenary without date Johnston/Fraser Second release banknotes. 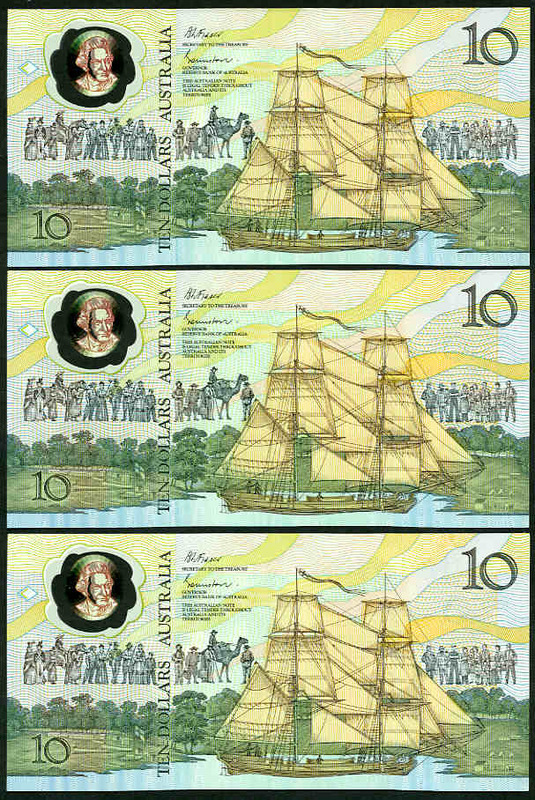 (10, 4 consecutive). 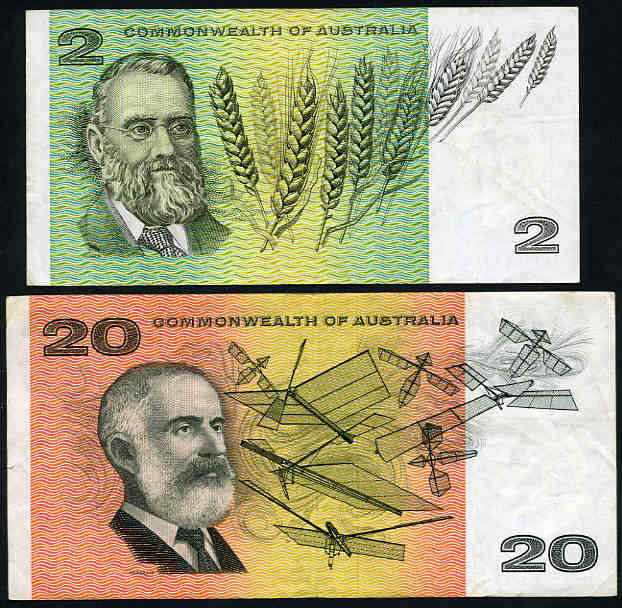 1988 $10.00 Bicentenary dated (5), 1988 $10.00 Bicentenary without date First release (1) and Second release (2), 1993 $10.00 Fraser/Evans (6, one first prefix AA93), 1997 and 1998 $10.00 Macfarlane/Evans and 2002 $10.00 Macfarlane/Henry first prefix AA02 (2) Polymer banknotes Unc. 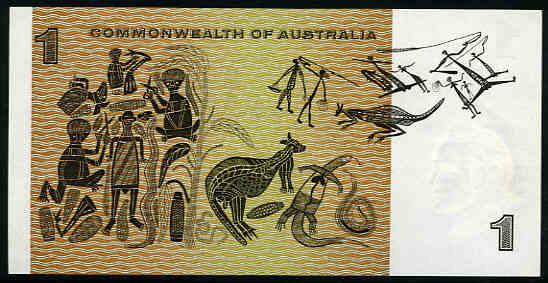 1988 $10.00 Bicentennial note with 26th January 1988 O/P in folder Unc (2). 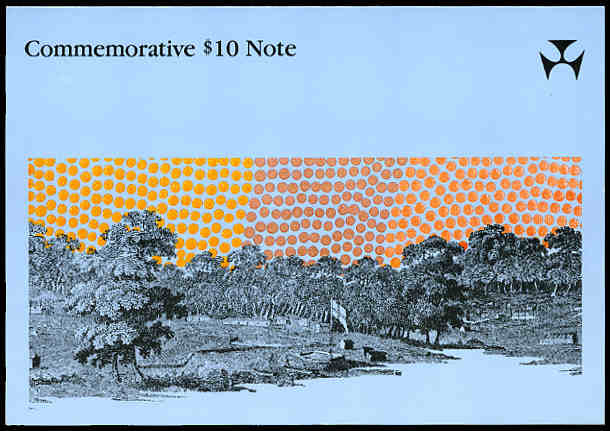 Also 1988 $10.00 Bicentennial 1st release Polymer note Unc. 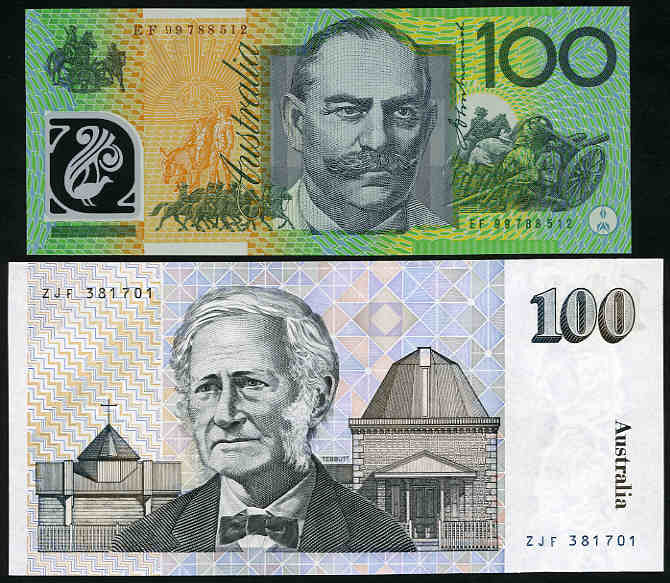 1988 $10.00 Bicentenary polymer note folder, 1993 $10.00 First and Last paper and dated polymer note standard folder, 1994 $20.00 dated polymer note standard folder and 2001 $5.00 Centenary of Federation dated polymer note general folder. 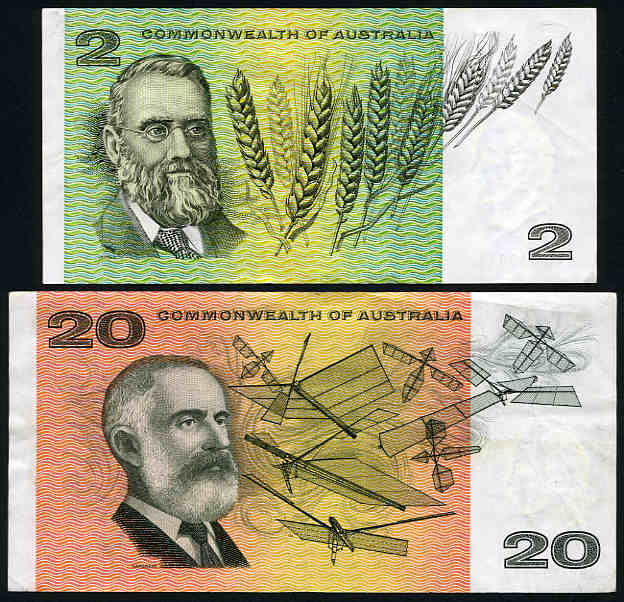 1967 $20.00 Coombs/Randall banknote F.
1972 $20.00 Phillips/Wheeler banknote almost EF. 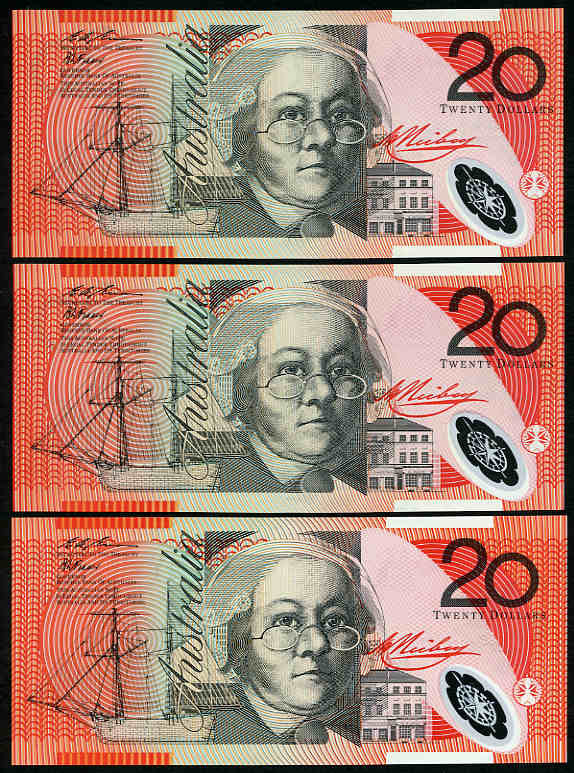 1983 $20.00 Johnston/Fraser EJY Gothic serial first prefix banknote aUnc. 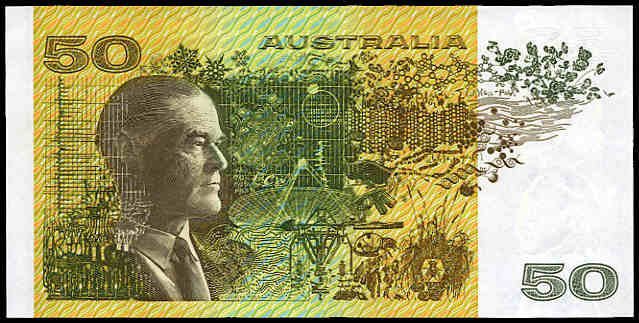 1994 $20.00 Fraser/Evans (3, 2 consecutive) and 2002 $20.00 Macfarlane/Henry (2, one with first prefix AA02) Polymer banknotes Unc. 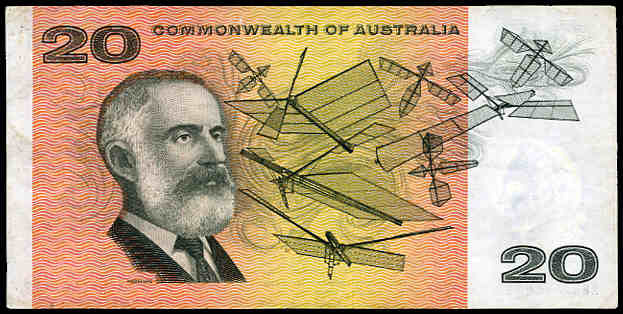 1994 Lawrence Hargrave Centenary limited edition black numbered portfolio containing $20.00 Paper note and 45¢ Aviation (Hargraves) pane of 25 with matching serial numbers. 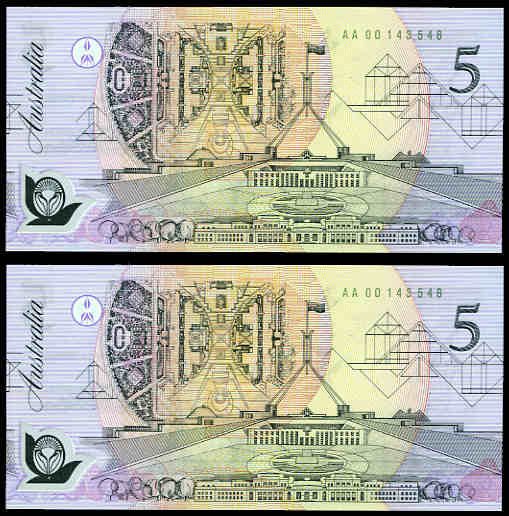 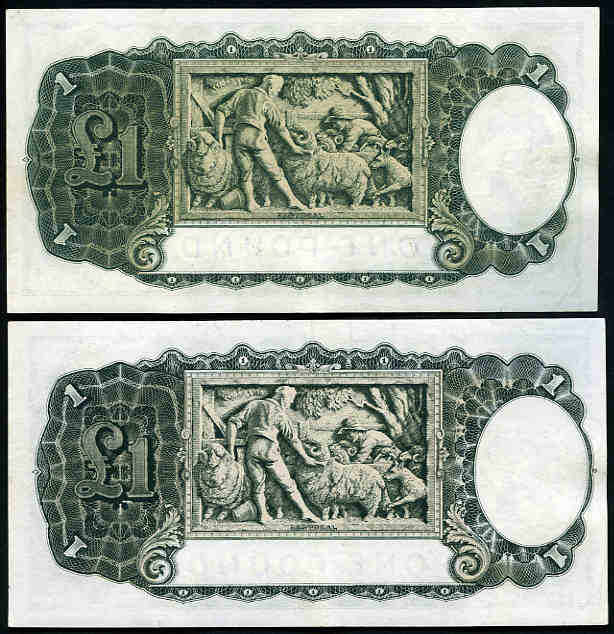 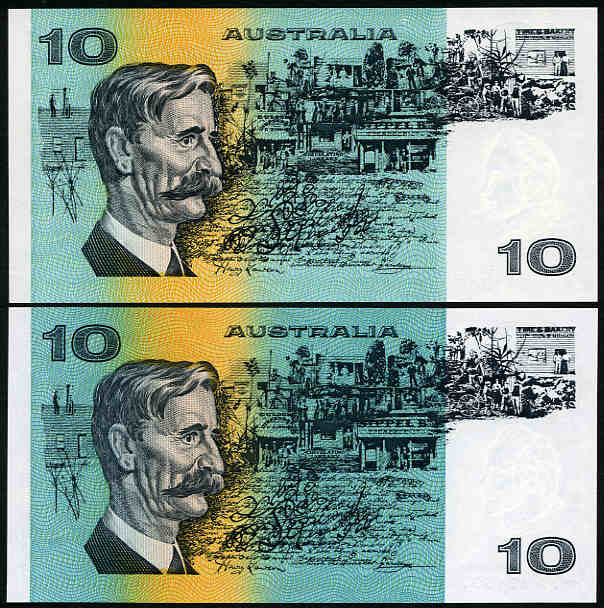 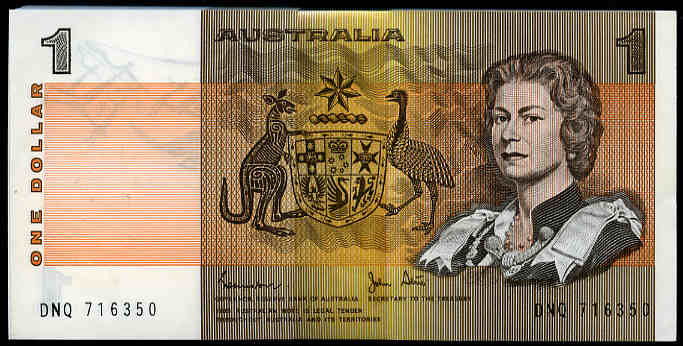 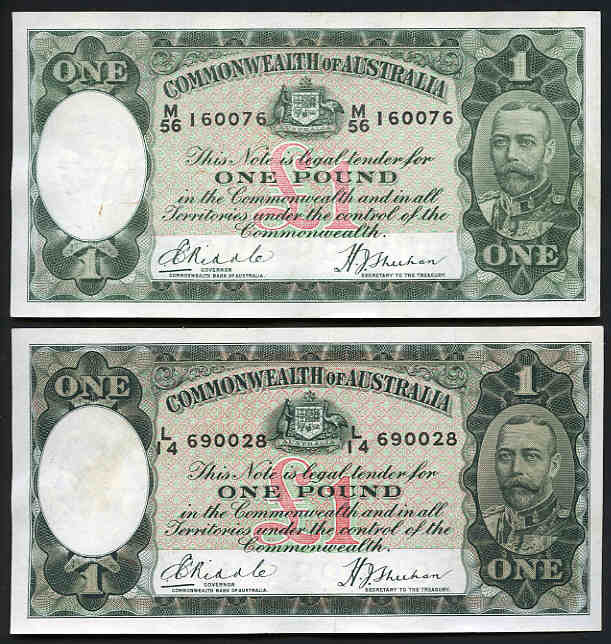 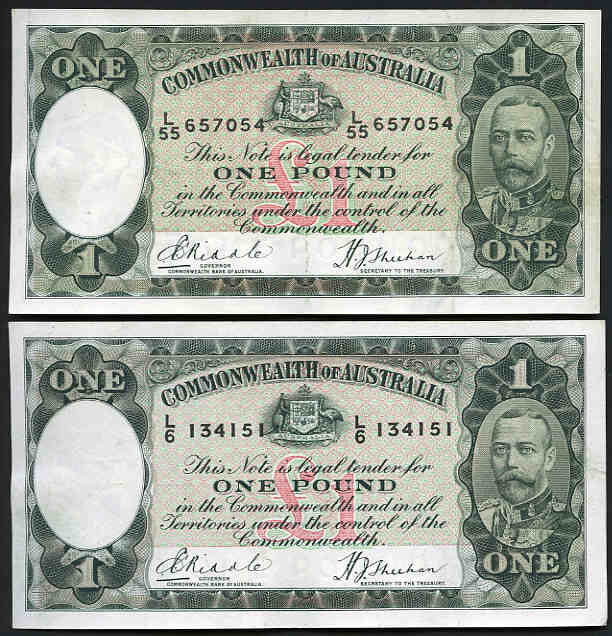 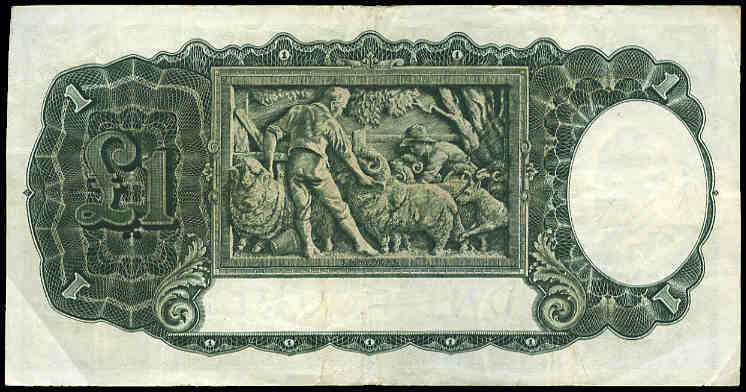 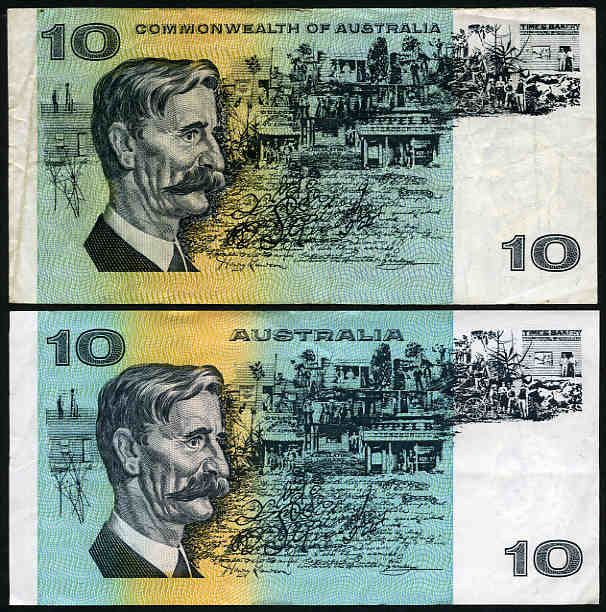 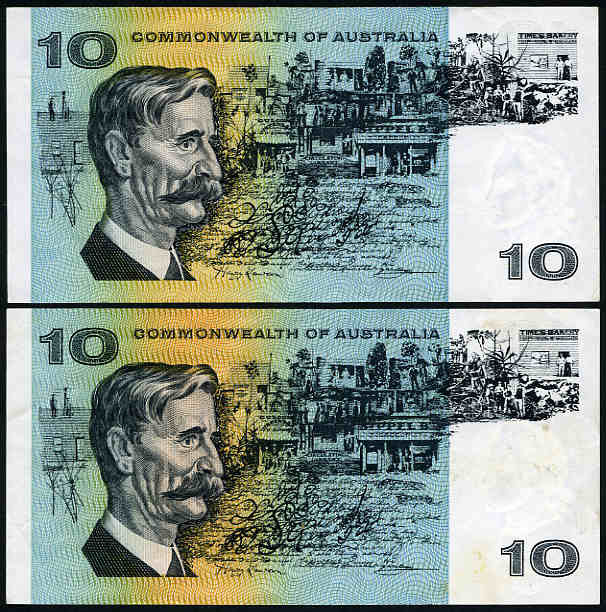 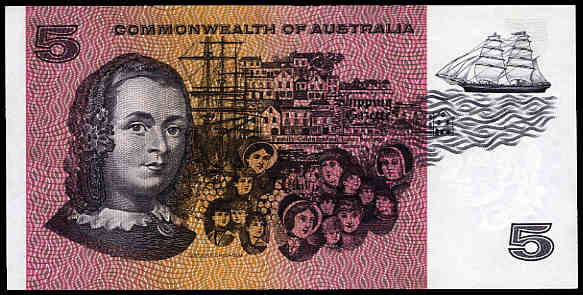 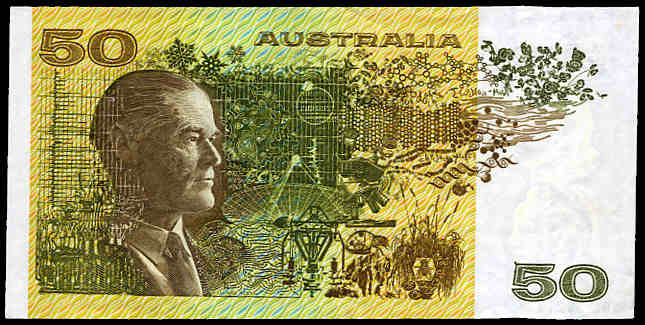 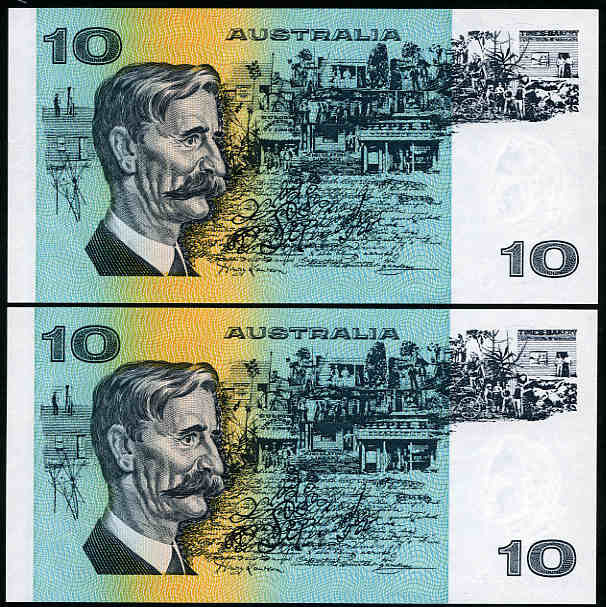 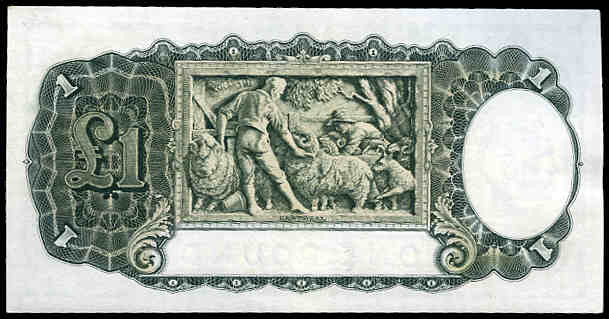 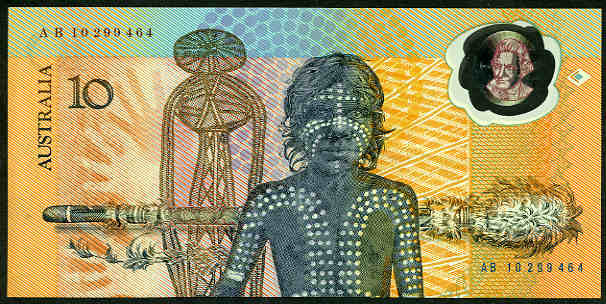 1979 $50.00 Knight/Stone banknote EF, with the black printing misplaced downwards by 5mm, causing the bottom line of print to appear at the top of the note. 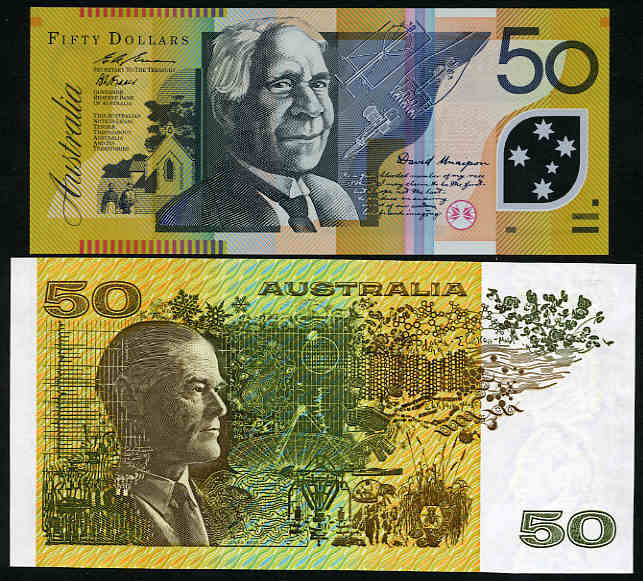 1991 $50.00 Fraser/Cole and 1993 $50.00 Fraser/Evans banknotes Unc. 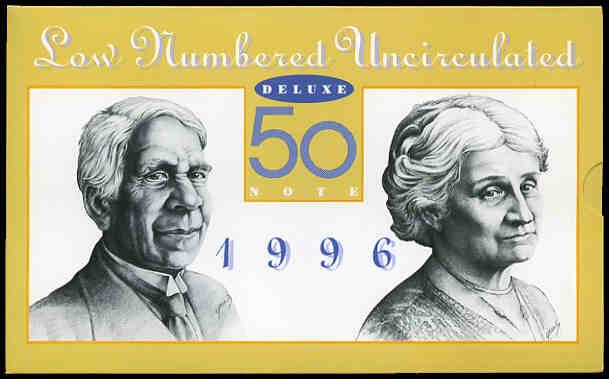 1993 $50.00 Fraser/Evans banknote Unc. 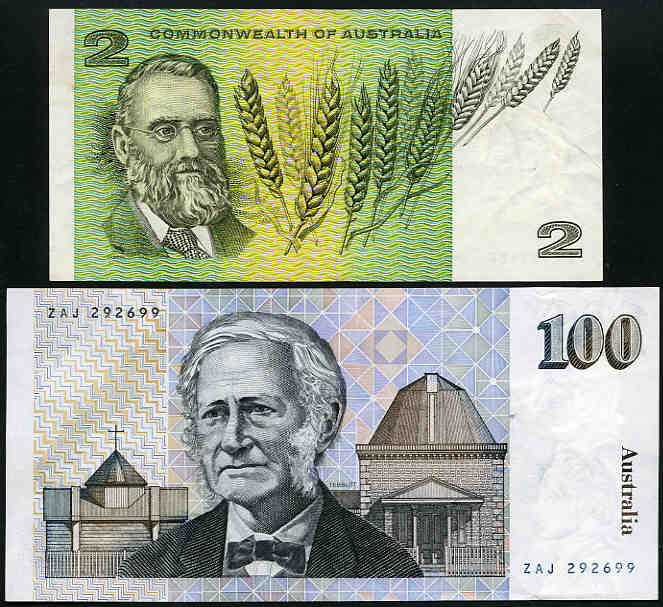 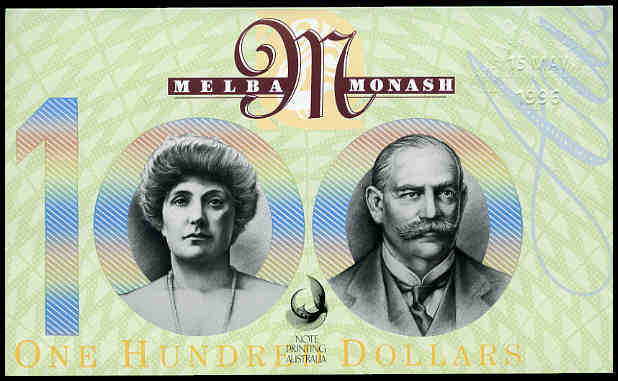 1991 $100.00 Fraser/Cole and 1999 $100.00 Macfarlane/Evans banknotes Unc. 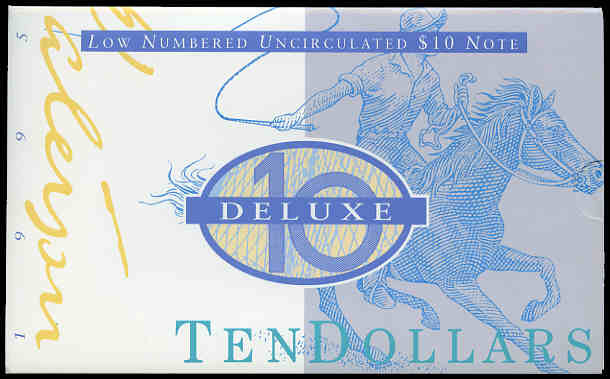 1996 $100.00 First and Last paper and dated polymer note embossed deluxe folder. 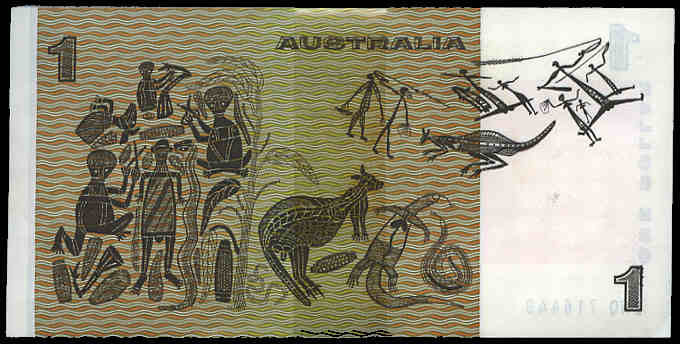 Serial No AA 96001114 and "ZLD" last prefix paper note. 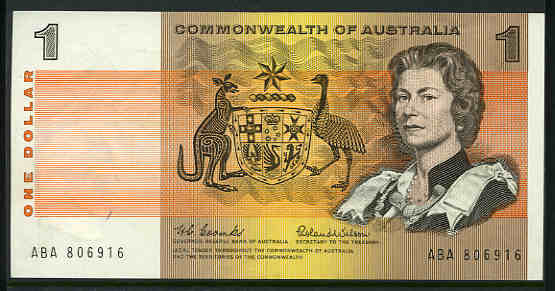 1996 $100.00 dated polymer note standard folder. 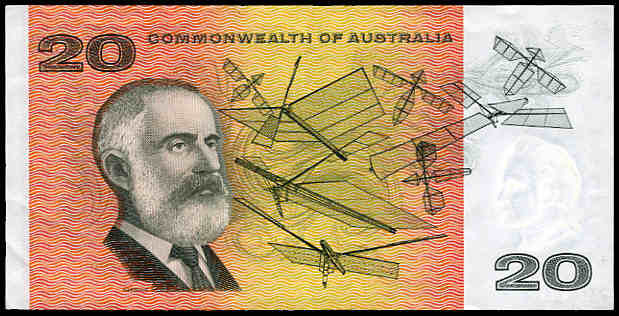 Serial No AA 96003936.